When it comes to Marvel’s list of movies that are an instant success with fans, the previous Thor films don’t make the cut. Outside of the lack of a solid villain & slow & dry plots, Thor & Thor: The Dark World just didn’t feel like the other Marvel films in the Marvel Cinematic Universe. However, with Taika Waititi helming the film & Marvel taking a brighter approach to Thor: Ragnarok, could this be the Thor film most fans have been waiting for since 2011? Thor: Ragnarok focuses on the return of Hela (Cate Blanchett), who was the secret & locked away child of Odin. With Hela pushing Thor (Chris Hemsworth) & Loki (Tom Hiddleston) aside to take her rightful place on the thrown off Asgard, Thor & Loki are left with no other option but to find their way back to Asgard with a team that can help them take down Hella for good. 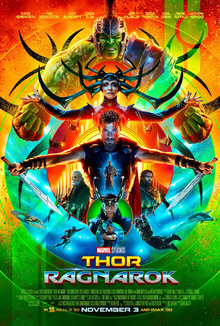 I will say that this is hands down the best Thor film in the series & will even go as far as to say that this was better than Guardians of the Galaxy Vol. 2. What makes Thor: Ragnarok better than the previous films is that Thor is no longer this brooding, lovestruck, & one-trick pony character. It’s clear that Hemsworth is enjoying himself in this movie, which brings a welcomed energy to the character & film. The film has definitely embraced humor as its main theme & has molded this into the Thor, Loki & Hulk characters. Speaking of Hulk, like Baby Groot in Guardians of the Galaxy, stole the show. Surprisingly, Hulk brought the laughs & added some much needed energy that was necessary to keep the film afloat. Sure, Hulk wasn’t in the film as much as I would’ve liked, but he still held down the movie in every scene he was in. Hiddleston’s Loki was definitely more relatable in this film & was more fleshed out in this film than he was in any previous Marvel film he appeared in. I guarantee you that you will find the scenes that contain Thor/Loki & Thor/Hulk are heart-warming & hilarious. At first glance, Blanchett’s Hela came off as being a big change, in a good way, for Marvel’s lackluster villains, but she ultimately fell right into place in the lame villain circle. The last battle between Thor & Hela was a huge lackluster & was over before moviegoers got to cheer for a victor. Skurge/Executioner (Karl Urban) was a waste of space & honestly didn’t contribute to the progression of the story at all. Newcomer to the MCU Valkyrie (Tessa Thompson) was a hit & miss at times, but she is a breath of fresh air & can easily see what Marvel wants to do with her in the future. As for Jeff Goldblum‘s Grandmaster, he put a funny spin on the character & is someone I am actually interested in seeing more of. Every 80’s movie lover will feel right at home with Thor: Ragnarok. It’s clear that Waititi is a huge fan of Flash Gordon & Led Zeppelin, & I am right there with him. The film has a lot more high points than low points but the low points are still visible. The dismissal of Anthony Hopskins send-off was also incredibly lazy & without much emotion. Waititi was an excellent choice to helm this film! His mixture of comedy, action scenes, Hulk & brotherly love made this film damn nesr perfect! The screenplay from Eric Pearson and the writing team of Craig Kyle & Christopher Yost really gave us something special with this film. I saw this in IMAX 3D, so I will say that you’d be better off paying the regular admission price than paying for an IMAX 3D experience that won’t deliver. In all honesty, I feel that Thor: Ragnarok felt like a soft reboot & is somewhat negating the previous two films to bring our focus in this much fun spin on the Thor character. I’ve had the most fun with Thor: Ragnarok than I’ve had with the previous Thor films & the two Guardians of the Galaxy films. Yes, I am saying that Thor: Ragnarok is much better than both Guardians of the Galaxy films. This is a must-see & for any comic book reader or moviegoer. Go see it!